Walking down the street pass storm grate in sidewalk and see trash at first then blinking eyes—a doll?—no, a baby. My heart stops I can’t find my voice as I call for help. I run down the block, it’s a dirty, poor old neighborhood, and I scream. Finally I start to make eye contact with a woman a block away who hears my screams—I gesture cradling a baby and shout/mouth “BABY”—then point frantically at the ground. She nods as if she understands this gesture and runs toward me. Another man passing behind her hears and runs too. I turn the other way and shout again, another man—late 50s Eastern European immigrant?—comes running after I do the gesture. I return to the storm grate and the baby is not making a sound but its eyes are slowly fluttering open and shut. Kneeling I pull the grate off and it is heavy but comes off surprisingly easy. For some reason there are two concrete slabs, about a foot wide and only six or eight inches long and perhaps an inch thick, covering the access. I pause a split second nauseated by the smell of sewage. I pull them off but I will not fit down that hole. A guy pulls up in a black convertible and someone explains about the baby. I shout that we need rope. The guy comes out of his car, says he has a waxwing, would that help?—He motions to the backseat of his car where a pair of homemade wings sits, coaxed bamboo and translucent paper—It’s something we use in Greek Myth reenactments, he says. If only this were Icarus! I cry out. The baby hasn’t budged but now its making a gurgling noise. I can’t fit down the hole—I panic—wait for the fire department to come? I hear people talking over my shoulder, and flash back to a pep talk I gave to a Walgreens or similar store. Forming teams of two I had them go around the store and bring back the most valuable item in the store, only to tell them No, the most valuable item in the store is YOU. And the collective gasp of realization and understanding made me smile, and was what I lived for. 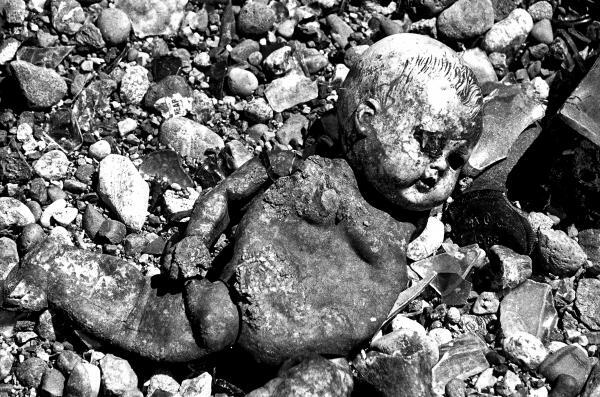 But this brought up another frightening thought as I looked back down through the hole at the baby partially submerged in sewage and litter—was it real? Was it just a doll? It was real. It was. People would be so angry if it they found out it was a hoax. That kind of anger would be deserved, people should really let out that kind of anger more often, but it’s also possible that it would be directed at me even though I was only the one who found the baby. It’s an honest mistake, or would be if the baby down below weren’t real and didn’t need immediate help.